Banners.com printed a vinyl banner for Don Gay Autos and Consignment. 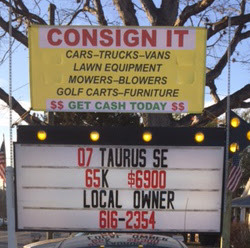 They used the banner to advertise for their consignment business. If you need a banner for your business, visit our business banner page. You can customize a template in our online designer, upload your own print ready artwork file, or work with one of our graphic designers. **This banner has wind slits. We do not recommend using wind slits in banners as it cuts a hole in the banner which can ruin the banner's integrity. We can do wind slits upon request if you need them per city or state regulations.